This should be interesting viewing. You bring the popcorn, I’ll bring the cig … er … nevermind. Rabbi David Wolpe of Los Angeles’ Sinai Temple, where Monica Lewinsky and her family were congregation members for decades and where Lewinsky attended religious school, is scheduled to deliver the benediction at the Democratic National Convention tonight — not long after Bill Clinton speaks. 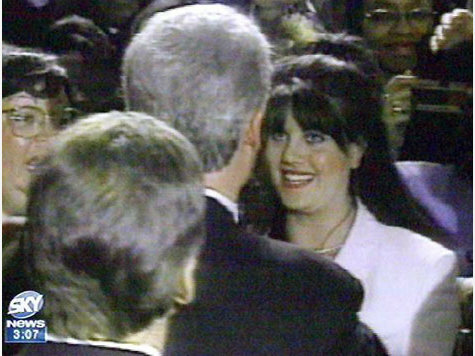 Not only was Wolpe the Lewinsky family’s rabbi, he also sharply condemned President Clinton at the time his sexual relationship with Lewinsky, then a 24-year-old White House intern, was dominating national headlines. And other news reports from the time noted that Wolpe accused Clinton of hiding behind a “flinty legalistic apology,” for his romantic dalliances with the young intern. Is this a potentially awkward situation developing for the pair back stage? Depends on what your definition of the word “is” is.